Similar to other browsers such as Internet Explorer, Firefox, etc, Google Chrome browser offers the browser tab feature which allows users to view multiple web pages in the same browser window without opening a new browser window. However, there is still room for growth and improvement in Chrome’s tab function. For instance, unlike Firefox, Chrome’s browser tab is unable to display thumbnail preview for all open tabs and hence users cannot take advantage of this shortcut facility to enhance their internet browsing experience. To further improve on Google Chrome’s browser tab feature and manage the open tabs better, users can add Tabs Plus, a Chrome extension to their browser. 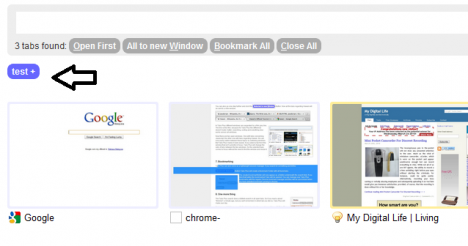 Tabs Plus is a supplementary add-on application to Chrome’s browser tab function. This chrome extension allows users to have thumbnail preview of all open tabs by clicking on a tiny icon at the browser’s address bar. Users can also go to the thumbnail preview display mode via keyboard shortcut, e.g. Alt-T for Windows, Ctrl-Shift-T for MAC and Shift-Alt-T for Linux. With this thumbnail preview, users can enjoy quick search and access to a particular tab especially if there are too many open tabs. When users click on a thumbnail, the corresponding tab will be selected in the browser. Besides, users can also arrange the display tabs into a new order with drag-and-drop. Other useful features offered by Tab Plus include tab grouping, multiple windows viewing, and bookmarking. Tab Plus can group all relevant search results next to each other when users use the tab grouping function. 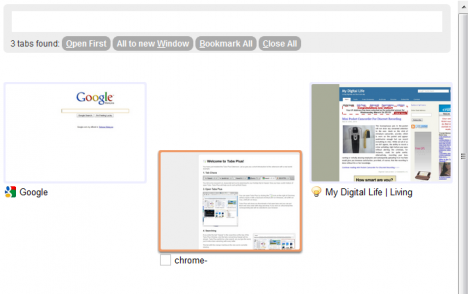 Users can use Tab Plus to open all selected tabs in a new browser window. Besides, users can also use the bookmark function to bookmark the selected tabs into a Bookmark Folder, e.g. Test folder as illustrated in the screenshot below. Once users click on the folder (Test), the browser will automatically open all the tabs stored in the bookmark folder.